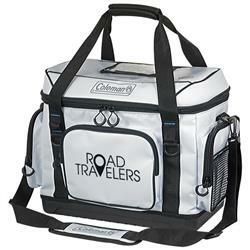 Coleman® 36-Hour 42-Can Marine Soft-Sided Promotional Cooler with your custom logo. This Coleman brand cooler is made of water-resistant material and features an antimicrobial heat sealed liner that resists odor, mold, mildew & fungus from forming on the product. 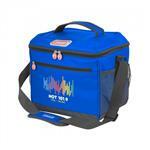 With Keeps the Ice!™ it allows 36 hour ice retention at temperatures up to 90 degree F - not your thin custom cooler bag. 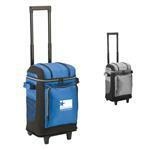 This cooler has a zippered main compartment with a top hatch for easy access and zippered side pockets, front and side mesh pockets for added storage. This cooler holds 42 cans. 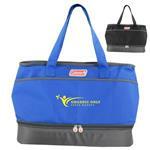 9.45" W x 12.60" H x 16.93" D. This is a quality custom Coleman cooler bag. 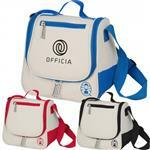 Production Times Available: Standard 5-7 Day Production with a Paper Proof. Free Rush Available!